48.75"w x 48.75"h x 1.5"t oils on board. 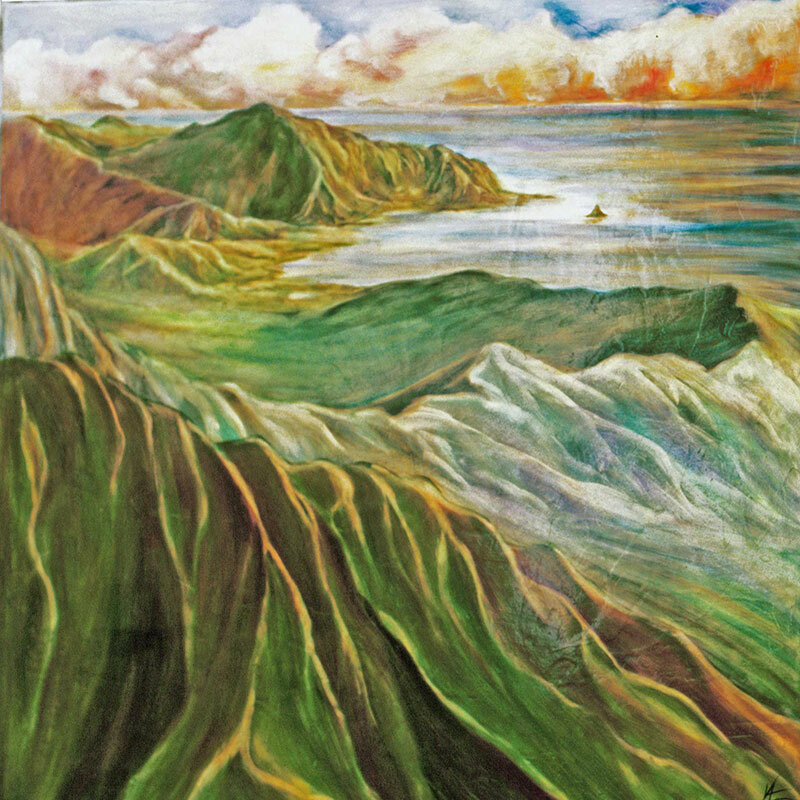 Oil painting topographical presentation of the view from the Koolau mountaintop range hike at Kaneohe Bay, Hawaii. Many refer to this hike as "Stairway to Heaven" on Oahu now. This painting was sold at Holy Family Hospital's, Shamrock Gala Fundraiser in 2007. The artist would appreciate being able to record who it was that purchased it. “Koolau’s Haiku K504” a self framed 48.75"w x 48.75"h x 1.5"t oil painting on textured board with multiple-coats of Damar varnish, which is glossy and gives a warm amber glow to the colors underneath. It is an oil painting done using a technique called rub-out oils with additional color brush strokes added afterwards. This image was inspired by memories from youth and an old photograph, of an area of Hawaii on the island of Oahu referred to as the Windward side. It is from a photograph taken in the seventies during a hike to the top of the ridge at Haiku where there is a Naval Antennae stretched between the ridges. The small island that you see in the distance, is a common image photographed for tourist calendars called, “Chinaman’s Hat” in Kaneohe Bay.